Just because this Contempo executive promotion pen looks expensive doesn't mean it is expensive. This colorful custom imprinted pen is cool and comfortable and its price is also budget friendly! This colorful bamboo promotional pen is eco friendly and comfortable and its price is also budget friendly! Get executive style with a stock promo leopard theme on the barrel of this custom imprinted pen! Get executive style with a stock promo recycle symbol theme on the barrel of this custom imprinted pen! Get executive style with a stock promo paw print design on the barrel of this custom imprinted pen! The Promo BIC WideBody Tri Stic Clear Imprinted Pen with Rubber Grip has three sides to hold your message. This Retractable Custom Pen w/ Rubber Grip comfortable and its price is also budget friendly! 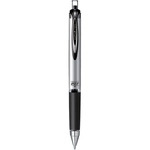 Retractable ballpoint custom pen utilizes the latest in ballpoint technology for a amazingly smooth writing experience. Retractable promotional pen available in eight great colors with comfort rubber grip.